It is normal for Cary, North Carolina to get about 4 inches of rain per month. In order to be ready for all that water, your commercial building’s foundation must be taken care of, otherwise you could end up with big problems for your business. Such conditions can lead to mold and mildew to grow and thrive. This could allow mold spores to spread throughout your business, putting your employees, and the value of your commercial building in danger. Fortunately, Atlas Piers can help with all of your commercial foundation failure problems. Atlas Piers is a team of foundation repair professionals that can help with all of your commercial foundation repair Cary North Carolina needs. No matter what you might need, Atlas Piers can help. We’re just a phone call away. If you notice some of these signs in your Cary business, there is no need to worry, we’re just a simple call away. Also, there is no reason to wait on foundation repairs, in fact it is best to catch problems early on before they come a serious structural problem. Your business is a big investment, and we plan on helping you keep its foundation, and its value, in great shape. When you decide to do foundation repair in Cary, NC, Atlas Piers is the experienced company to help you bring your foundation back. When we do our underpinning we use the best products on the market made by Earth Contact Products (ECP). Their products are reliable and do the job that is needed when we do the underpinning of your foundation. Helical piers are screwed into more stable soil to strengthen and stabilize your foundation. Another product we use are steel push piers. These are pushed into the soil and lift your foundation to the original level. No matter what your commercial foundation repair in Cary, NC, needs are, our team at Atlas Piers will make the best plan for a safe foundation for you and your business. Foundation problems can come in many different types and varying levels of seriousness. No matter what type of foundation you may have, however, Atlas Piers has a solution for you. A common foundation problem that often affects the buildings in Cary, North Carolina is a sinking or settling foundation. 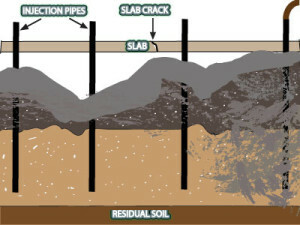 Fortunately, Atlas Piers has many years in the underpinning process to help repair your sinking or settling foundation. By installing a foundation pier beneath the sinking or settling foundation, we can have your business back to normal in no time. In addition to our several underpinning products, we offer a variety of solutions for other foundation issues. Our carbon fiber repairs and helical tiebacks can be used to restore bowing or cracking foundation walls. Atlas Piers also specializes in pressure grouting to fill voids beneath your foundation. This is another method often used to lift and stabilize sinking foundations. We even offer encapsulation services to keep your basement or crawlspace dry. Vapor barrier installation (encapsulation) will not only ensuring that your basement stays dry, but will improve the air quality in your business, keeping both you and your customers healthy and happy. So no matter what problem you might have with your foundation, Atlas Piers can provide it. It could be encapsulation, underpinning, or pressure grouting. No matter what, we have you covered. We will inspect your home or business and give you an estimate of what it will cost. Call Atlas Piers of Atlanta, your foundation repair in Cary North Carolina team.